Eurodent : More affordable than you think! 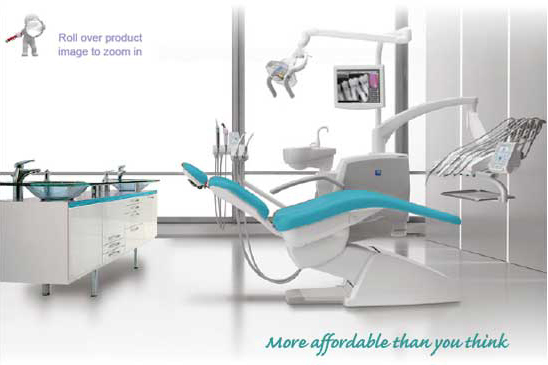 EURODENT USA is a leader in dental technology, European style, function, and unmatched comfort. Eurodent's dental products have made it possible for dentists to break free from a rigid framework in treatment, allowing them to experiment with new dental equipment that improves their work methods. In keeping with the demands of the dental profession, Eurodent offers a variety of dental products such as dental chairs, a wide selection of dental instruments and accessories, digital X-ray sensors and panoramic X-ray, including integrate imaging systems and digital radiology equipment, modular dental cabinets and laboratory, and much more. Please consider us before you make your next purchase. You will be provided with affordable prices, professional technical services and repair, attractive finance options, and FREE office design. Our website serves as a virtual showroom so you can explore the exciting details about our state-of-the-art products and services.